Just the other day, we wrote a post congratulating our client, Mueller Pet Medical Center in Sacramento, California, for their well-deserved 2014 Veterinary Economics Hospital Design Award. We were thrilled because hospital owner Dr. Ken Schenck mentioned that he used several TriStar Vet products in his design, including our veterinary wet tables with patented WaterFlo system as well as our work islands (towers) that cleverly hide water and electric cables while providing ample storage. 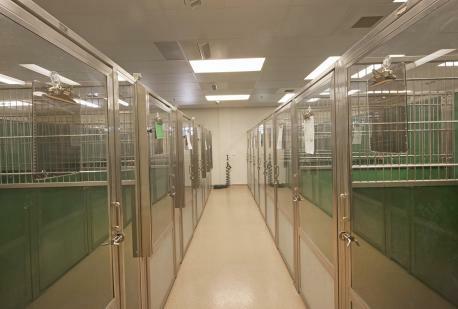 Mueller Pet Medical Center also installed TriStar Vet dog kennels and runs. Here’s what they had to say about this essential equipment. Mueller Pet Medical Center is one of the Sacramento area’s finest veterinary hospitals and it offers much more than pet health care. They offer dog boarding, daycare, grooming and cat lodging. When they designed their “Pet Inn” lodging facilities, they chose TriStar Vet equipment. Owner Dr. Ken Schenck explained why. “I love TriStar Dog Runs. The welds are great and the heavy plastic wall panels are not only beautiful but durable. I love the glass doors. And the clouded glass (rain) lower sections on the front doors are elegant looking and provide privacy. Dr. Ken Schenck and his team were a joy to work with, and we’re very proud and glad they chose our dog kennels and runs for their quality Pet Inn services. We know their equipment will last for decades… even with daily wear from rambunctious animals of all sizes. To discuss your dog kennel design needs, contact the TriStar Vet team at 877.459.7827 or sales@tristarvet.com.